Beach Life is one of the biggest progressive slots online and is found at all Playtech casinos. The jackpot starts at $50,000 but has gone into the millions many times. To qualify for the jackpot you must play the maximum bet of $10 per spin. 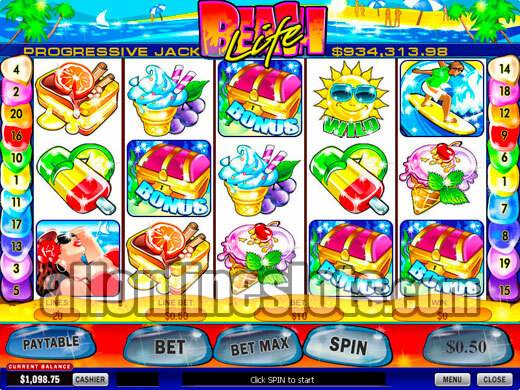 Beach Life is the biggest jackpot game found at Playtech casinos. While the jackpot starts at just $50,000 the highest ever win is $4,800,298. This makes it one of the biggest paying slots online. The game uses the highly popular 5 reel, 20 line format and has a bonus feature to add to the fun. As the name suggests the game has a summer beach theme. It has a fixed coin size of 50c and a max bet of 20 coins. This means you are looking at betting $10 per spin to have a shot at the jackpot. While you can play less than max we highly recommend that you don't. If you play less than max you cannot win the progressive. If $10 per spin is too high for your budget we suggest looking for a different game. If however $10 per spin is within your budget you can have access to some huge jackpots. The sun symbols are wild and act like a joker for everything but the Bonus symbols and the scattered sand castles. Line up five wild suns on the 20th pay line and you win the progressive. Get the five wilds on any other line and you win 100,000 coins or $50,000 - a very nice second level win. Like most progressives there is a big drop to the next payout level which is 10,000 coins for five of the scattered sand castles anywhere on the reels. The rest of the five symbol pays award between 500 coins (Five Divers) to 50 coins (Five Ice Blocks). There are 26 winning combinations in total. The treasure chest symbols give you another way to win. Get three four or five on any active line and you win 3, 4, or 5 picks on the bonus. 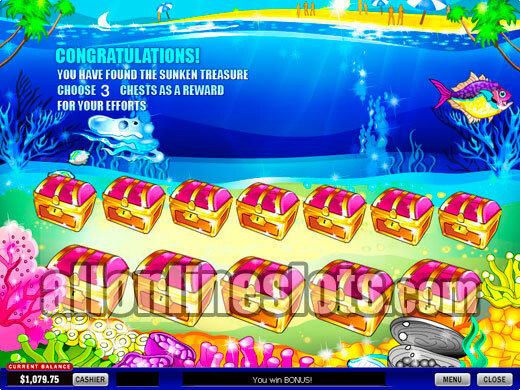 The feature screen is an undersea scene (Screenshot) where you get to pick treasure chests. After each pick a win is awarded and when all picks are complete the bonus ends. Beach Life is one of those games where if you get lucky you win a life changing jackpot. Of course the chances of winning the jackpot are very low but as with all progressives someone will be the lucky winner. If you want to have a shot choose one of the Playtech casinos listed below.